The IPS concentrators operate within the PALLADION Central Security Management System (CSMS) as field peripheral devices. These concentrators communicate with the PALLADION system servers over LAN/WAN. The use of two independent channels of communication (wired links and GPRS/radio links) and data encryption enables building a reliable and secure system for managing the security of facilities distributed over the entire country or even globally. This solution allows for ensuring the appropriate level of security for very sensitive information transmitted within the CSMS system, even when the security management system uses existing, secured transmission networks within the institution or corporation. The IPS concentrators can also be used as elements for building top-class, local security systems for large industrial or military complexes, or airports. These concentrators operate with the ULISSES Integrated Security System. As a standard, the IPS concentrator is equipped with an Ethernet communication port and an industrial GPRS modem used for communication with the supervisory system. The following IO facilities are available for integration with local security systems: 24 universal two-state inputs, 2 analogue inputs, and 3 RS232C serial communication ports. These ports can be configured depending on the type of systems being connected: Intrusion and hold-up system control panels, Access Control System controllers, etc. The base equipment of the IPS controller also includes 8 relays, freely configurable from the level of the supervisory system. The IPS_CA module for a 13-line I&HS control panel constitutes an additional equipment of the IPS concentrator. The concentrator is ready for the procedures of centralised management of encryption keys by the PALLADION/ULISSES system. As a standard, the concentrator provides full functional interoperability with the Integra and Galaxy families of control panels from SATEL. It also acts as the concentrator for a group of the KP-2BS controllers within the Access Control System. 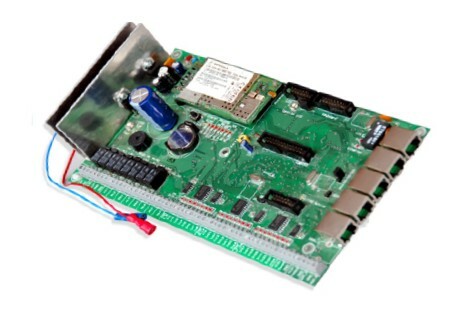 After being supplemented with the IPS_RS serial port module, the IPS concentrator can additionally monitor a fire alarm system control panel, using the Telsap 2000 or PMC 400 protocols. The IPS concentrator can be configured locally, using the IPSView utility program, or remotely, from an application at the CSMS system level. All data transmitted between the IPS concentrator and the server are encrypted using the DES encryption algorithm. In the special version of the concentrator, data are encrypted using the AES algorithm with 128 bits long encryption key. The concentrator is equipped with a Real Time Clock with battery backup. The server provides time synchronisation between itself and each of the IPS concentrators connected. 8 characters long access password.